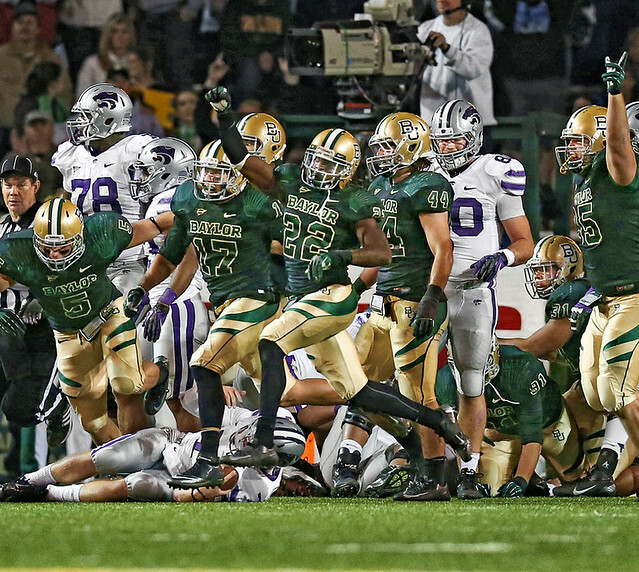 The photo you see above, from the Nov. 17 Baylor/K-State game, ran in this week’s issue of Sports Illustrated. Only problem is, Baylor didn’t wear green jerseys for that game — they wore black. Indeed, the original photo SI used, by US Presswire shutterbug Matthew Emmons, shows Baylor wearing black. But SI for some reason chose to change the jerseys to green. Why? That question was ricocheting around the media world yesterday. The story was originally floated by the Dallas Morning News, after which it was picked up by media watchdog Jim Romenesko and then, of course, Deadspin (which has a nifty little photo slider, allowing you to compare the black and green versions of the shot). As you can see in the updates to those stories, SI is blaming the whole thing on an unspecified “production error” and seems unwilling to address the matter any further. Obviously, the green jerseys look better; just as obviously, that’s not the point. Lots of people seem to be piling on and accusing SI of nefarious photo manipulation, but it seems to me that something’s missing: a motive. Why would SI do this? What do they have to gain? It doesn’t make sense. Could it have been an innocent mistake? Sure: Maybe someone at SI (a) didn’t realize that Baylor was wearing black, and (b) mistakenly thought that some trick of the light had made the green jerseys appear black, and then (c) mistakenly color-“corrected” the jerseys to make them look green again. Except why would SI, a magazine whose very name stands for photographic excellence, use a photo that supposedly required such extensive color-correction in the first place? Why not just find another photo? Again, it doesn’t make any sense. But one thing’s for certain: All this trouble could have been avoided if they hadn’t worn those miserable BFBS jerseys. That last sentence also applies to yesterday’s Notre Dame/Kentucky basketball game, which found the Irish wearing some of history’s worst-conceived hoops uniforms. Check out this photo gallery and this photo gallery, and see how often you can read the lettering and numbering on Notre Dame’s jerseys. As several people have said to me, “How is that even legal?” Good question. But maybe we can get Sports Illustrated to provide us with green versions of the photos (or at least get Deadspin to provide a photo slider). Uni Watch News Ticker: The Falcons wore their throwbacks last night. And as you can see in that photo, Roddy White got a little creative with his socks. 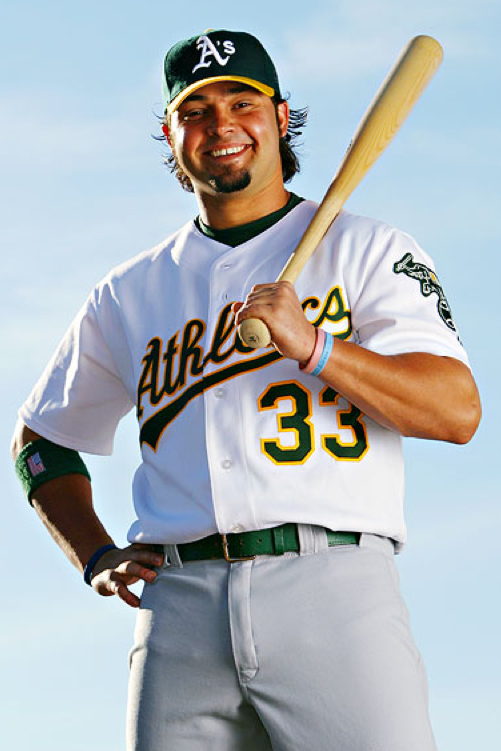 ”¦ Here’s a classic spring training shot: Nick Swisher wearing a home top paired with road pants. I’m sure the photo was meant to be cropped above the waist (from Johnny Bruno). … Not sure which game this is from, but Colin Kaepernick had some serious uni number issues at some point this season (from Chris Flinn). … If you’re an NHL goalie, who ya gonna call? Ghostbusters! (From Alan Kreit.) … Now that Russell Martin has left the Yankees and is headed back to the world of NOBs, it’ll be interesting to see if he revives his old “J. Martin” NOB. As you may recall, he added the “J.” for his mother back when he was with the Dodgers. 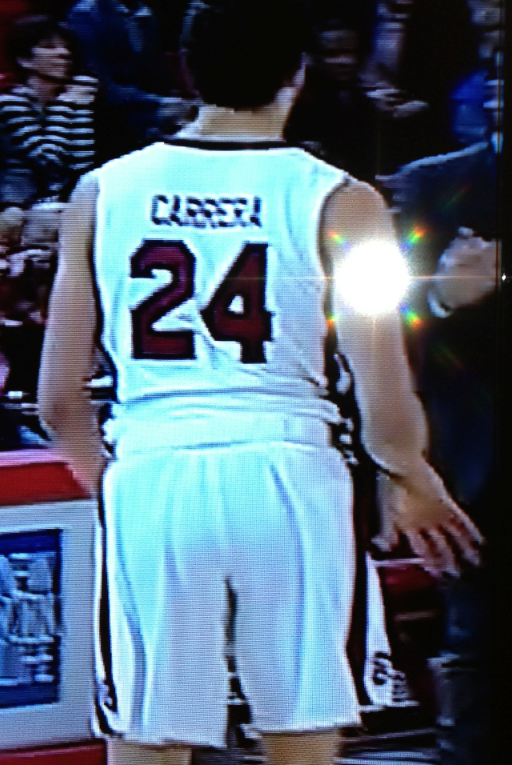 ”¦ South Carolina hoops player Michael Carrera apparently thought his shorts were too long, because he rolled up the waistband several times over last night (from Scott Novosel). 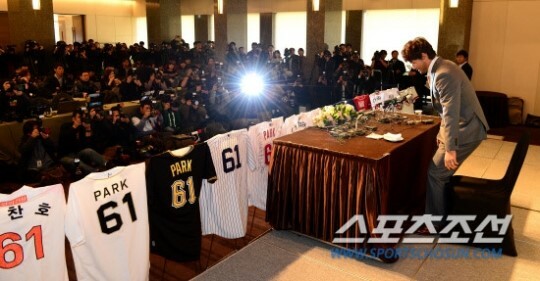 ”¦ Chan Ho Park held a press conference for his retirement and they displayed every jersey he’s worn (from Dennis Abrams). 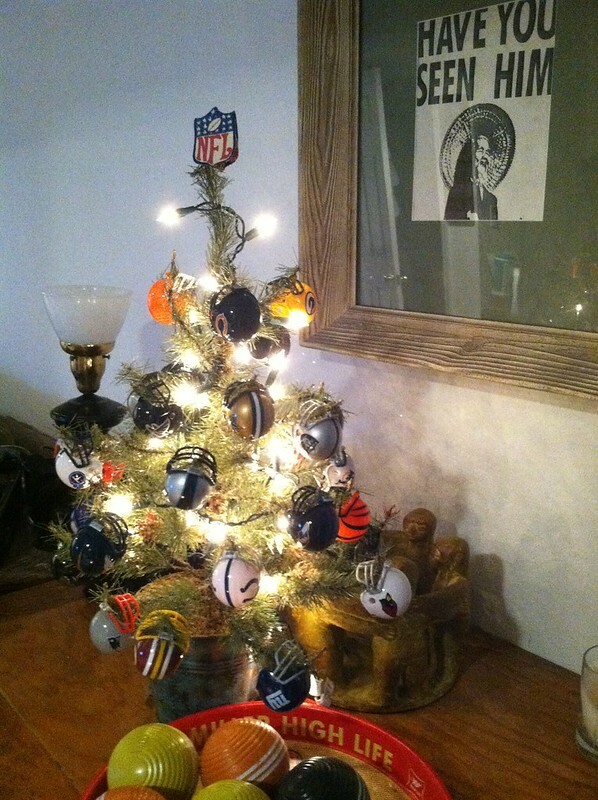 ”¦ Lots to like in Martin Hick’s NFL Xmas tree. ”¦ If the Hornets choose a more Louisiana-ish name, as has been reported, the Bobcats might rename themselves the Hornets (from Mike McLaughlin). ”¦ Jon Helfenstein has found some more photos of the Orioles wearing solid-orange in the early 1970s. Also: He’s found a solid-orange Frank Robinson figurine! I think the mystery gumball helmet is probably Panthers with insufficient space where the stripe bifurcates. The Panthers stripe is a little weird. I know. I thought that might have been it… but then I thought it could have been a DIY’d prototype or something. You need to upgrade to the Pocket Pro helmets… they’re just a little bit bigger, but much more accurate. Does the “furor” over kaepernick and his tattoos qualify for uniwatch discussion? Whole thing seems pretty silly. For sure it’s silly. Like a lot of stuff we care about. “Obsessive Study of Athletics Aesthetics” would cover athletes’ tattoos, I should think. I don’t know what Kaepernick’s tattoos say or depict, but it would be interesting (well, to me, anyway) to compare them to other NFLers and then compare NFLers designs to NBAers, etc. The guy from The Sporting News who criticized Kaepernick for looking more max-security inmate than high-minded NFL QB is full of beans, imo, but it is kinda interesting to realize that most QBs don’t seem to sport tattoos (long sleeves a factor?). There are obviously ethnic and social dimensions to the frequency and character of tattoo-sporting — for me, at least, Kapernick’s arms evoke the guy who runs the Tilt-A-Whirl at the county fair — and it might be interesting to see how they play out on the bodies of athletes. Not that I’m going to do anything about it. I don’t know about all of them, but according to Matt Barrows, the 49ers beat writer for the Sacramento Bee, most of Kaepernick’s tattoos are Biblical inspired. IMHO, athletes’ tattoos should be right in UW’s wheelhouse. I’ve been itching to say what I think of tattoos for years: which ones are good, which ones are bad, etc. Agreed. I’d love to see a Uni Watch feature on athlete tattoos. The problem I’ve found with discussions of tattoos is that inevitably someone will ALWAYS pipe up with “It’s their body and they can do whatever they want with it!” As though tattoos are somehow impervious to bad design and/or execution, and should never be criticized. Also altered in the Baylor picture: the skin tones of several players. Wonder if there’s an older Baylor grad somewhere in the art department at SI? Or perhaps someone at the photographers studio did it? Either way, its journalistic malfeasance on someones part. “Malfeasance” implies evil intent; I suspect this was actually misfeasance (i.e., incompetence). Otherwise, it’s just malfeasance for malfeasanceses-ses sake. Nice Dwight Schrute reference, Kek! Gotta agree with Paul on the intent issue. What’s more plausible…a Baylor grad and/or BFBS-hater happened to be assigned the photoshopping job on the picture? Or that after an editor selected the photo and an artist was assigned to process it, the photo was overprocessed to the point that the black jerseys became green. At best, it was an honest mistake by the artist who, as dark as the background was, assumed the black jerseys were green and tried to adjust the photo as such. At worst, either an editor or an artist thought the green would pop off the dark background a bit more and, since green is Baylor’s primary home color, made the decision to colorize the jersey. Maybe it was a Uni-Watcher trying to make things right. He (or she) probably thought, “You know, green looks better, and this is my chance to show Baylor and everyone else that.” I would’ve done the same thing. It’s on all the players, KSU included, and the purple in their uniforms is much lighter. I noticed the same thing, looks like the entire picture has been color corrected or altered. It looks like they did a brightness/contrast adjustment, and then changed the black to green on top of that. Hmm… that’s odd… Baylor wears green, not black. I’ll just lighten this up a bit and raise the contrast… wait… why are Baylor’s jerseys still black? What the hell? Ok, fine, stupid freakin program… I’ll just change them to green myself… There. That looks better. The odd thing is that the shoes have definitely gone from black to green, like the jerseys, but the socks just seem to be black with the brightness value turned way the heck up so they’re kind of hazy gray. Everything about the photo is corrected. The turf is much greener. It’s much brighter as a picture on a whole. No doubt that Baylor in green is much more stunning than Baylor in black. I would guess someone assumed the unis were green and made them green. What more concerns me is that SI is running wire photos. Isn’t that what Sports Illustrated is all about, taking the best, most original and interesting photos and displaying those for us? It’s not about running wire photos. The (somewhat) larger issue is that SI won’t just come out and say what happened. Mistake? Someone over-corrected because they couldn’t imagine Baylor wearing black? I can see that, too. I can see that slipping past people who don’t keep up with BFBS. Until and unless SI actually owns up to what happened, it’s a lie. You don’t see the issue with altering photographic depictions of reality? Really? Whoever was this cat at SI should be fired. The Gold/Black/Gold look was pure greatness. Those ATL throwbacks are just about the best looking set in today’s NFL. Funny because their regular kits are orders of magnitude worse than any others out there. SI’s Baylor goof jerseys look pretty swell too. I said this last night. Absolutely agree. That uniform set is great. Didn’t they have an inverse set with a red jersey/black helmet? I would like to see them wear that at some point. But to me, the red helmet/black jersey is an all-time Top 5 look. SO much better than their current set. The uniform is beautiful. The departure from that to their present clown suit is hard to digest. And their original logo, to me, was iconic–so dignified, so smart, spare, solid. That thing on their helmet now looks like it was chewed up and spat out. Didn’t they have an inverse set with a red jersey/black helmet? Nope. They’ve only done red/black with the current uniforms. They went from the original black jersey/red helmet to red/red, then black/black prior to what they wear now. They did have a white jersey with red numbers while wearing the first black helmet, but that’s as close as they got. Yep. The gold stripe needs to go. The rest of the uniform looks great! Ok… I remembered both a red and black helmet with the original logo, and also both jerseys, but didn’t realize black over red was just a recent addition. The Falcons throwbacks are THE best looking uni’s in the NFL. To me, they edge out the Raiders, Bears and Packers because of the way that beautiful red helmet pops against the black jersey. I mean, wow! How anyone can think their regular disasters are better is mind boggling. The throwback is 10 times better than their current look. But I think the throwback is way overrated as a uniform. It would rank somewhere in the middle of today’s sets. Nice to see all those solid orange Orioles photos appear. Now if only some more photos of the 1970s Braves nickname uniforms would surface. Ironic that newspapers would ask how that could happen when it is at newspapers that it happens most! Anyone who does design know that since about 2004 newspapers (and magazines) have been using auto-toning software for pictures. The software is great when one has a normal range of tones, but not when the photo is mostly blacks or mostly whites (or both). The software tries to map the picture’s histogram to whatever curve it’s programmed to (usually a bell curve). If there aren’t a good range of tones, it will create them using areas of the image that should be near white or near black! (You should see what it does to nighttime wildfire pictures — wow). It’s more than possible that’s what’s going on here. The kicker is the whole image’s colors are changed — the dark areas in the stands especially, not just the jerseys — and weirdly colored pixels are present all over. … Just the latest example of paying for software to do what a human can do better. I loved the Falcons TBs. What I didn’t love was the “candy cane” effect on some of the players socks. If it isn’t one thing, it’s the other. Hey, New Orleans! Get rid of your black pants! I’m not sure what I find worse: the idea of the Bobcats assuming the identity of another NBA team, or whatever New Orleans decides to call themselves switching to such a boring color scheme. It would be worth it just to see Charlotte take the floor in those original Alexander Julian-penned uniforms, where the pinstripes end at the belt line. I unfortunately assume the gold will be Vegas instead of Athletic, not that it really matters because red, gold & navy is not very original or good looking. I’d still rather see them in Mardi Gras colors. Don’t know how I feel about a team taking another team’s former name. I guess it’s the same thing as the Washington Senators II. Blue, Gold and Red are still the colors of New Orleans, however boring. I think it’s perfectly appropriate. Not sure if this has been posted within the last day or so, but here is Pens’ goalie Marc Andre Fleury’s 2012-2013 mask. Article also links to his masks going back to the 2009 season. Too bad he will probably never get to use it this year. Any chance we can use “Christmas” this year, instead of “Xmas”? I tend to use “Christmas” when referring to the religious holiday and “Xmas” when referring to all the pop-cultural and non-religious stuff that’s an outgrowth of the holiday (like, say, an NFL Xmas tree). And I plan to stick to that style. I’ll still stick to my format because it’s my format. But the backstory is interesting. Good point, Paul. The ‘X’ in Xmas and the ‘X’ in Î™Î§Î˜Î¥Î£ (fish in Greek and a common Christian symbol) both refer to the same thing: Christ (or in Greek, Î§ÏÎ¹ÏƒÏ„ÏŒÏ‚ (christos), the anointed one). I second that!!!! Merry Christmas!!!! My favorite part of Marty’s NFL Xmas tree is the Animal Chin print watching over it. That’s actually a picture of Buck Chin, the realator. Or is it Nancy Chin, the manacurist? I used to be an editor at a popular magazine, and one time the art director decided he didn’t like the color of the shirt one guy was wearing in a picture that was supposed to be on the cover. So he just changed it from green to red. I was appalled – to me, it was no different from printing a false fact about the band within the magazine. The color of that man’s shirt was a lie. And it’s not like it was going to sell one extra copy of the magazine. But, I wasn’t in the art department, so no one listened to me. That shirt will be forever, dishonestly red. Similar story to that of Eminem on the cover of Rolling Stone. I like the cut of your jib, Tom. I actually teach a journalism ethics course at a university and if you wouldn’t mind terribly sharing what issue of the magazine it was, I can include it in a lecture next fall. I think the ethics of this aren’t quite so clear-cut as you’re making it sound. Some photos are supposed to BE something (like the Baylor photo — it’s a photo of the Baylor football team). Other photos are just supposed to REPRESENT something. An example would be a posed photo with a bunch of models around a dinner table eating a meal, which is the kind of thing done all the time in food magazines. The people in those photos aren’t really good friends at a dinner party — they’re models simulating a dinner party. If an art director wanted to Photoshop the colors on someone’s shirt in that situation, I’d have no problem with it, because the photo was only representational to begin with — it wasn’t literal. How about all the baseball cards that show a player who’d been traded, so Topps airbrushed a new cap and/or jersey onto him. Ethical? Yeah, like every time an MLB player gets traded, ESPN already magically has a photo of them in the new uniform. Or like in the first “Rocky” movie, when Rocky points out the poster has red shorts with a white stripe when his actual shorts are inverted. Paul, love ya, babe. But the ethics are clear to those of us who actually teach ethics. And, yes, the ethics really ARE that clear-cut. Because ethical journalists don’t lie. And baseball cards aren’t journalism. I simply hated the horrible airbrushing that Topps did. Even as a little kid, I knew it was fake and it annoyed me. This wasn’t a bunch of posed models, though. It was a band, and we were supposedly representing how this band actually looked. Fans are interested in that sort of thing, and bands do put some thought into how they want to present themselves. And there wasn’t a stylist who had dressed them. If the reporter had written “Jack White showed up for the interview in a green T-shirt” (it wasn’t Jack White in the picture, but I can’t remember the guy’s name) when he was actually in a red T-shirt, the fact-checker would have found that out and made them change the piece. I don’t see why the cover photo should be treated any differently. this isn’t at all religious related, but I hate the use of Xmas instead of Christmas. just saw the above post/response, but I still don’t like Xmas. Using X as an abbreviation for “Christ” is actually older than at least three of the Gospels. So if you’ve got a problem with Xmas, take up your argument with the Apostle Paul and the First Century churches he founded in Turkey and Greece, not Paul and UW. So says Wikipedia. Makes sense, when you consider the Gospels were originally written in koine Greek, the … dare I say it? … lingua Franca of the time. Oops, didn’t see y’all had addressed this already (go, liberals arts educations!). I should have scrolled down! You don’t have to like it, just like I don’t have to like purple. If you choose to believe that Uni Watch is part of some conspiratorial “war on Christmas,” feel free to report me to Bill O’Reilly. Meanwhile, I have to go get physical therapy on my shoulder. Bye. Looks to me like ND went with blue numbers outlined in green instead of black numbers. Either way it is hard to distinguish the name on the back of the jersey from the rest of the jersey. Plus, what is going on with the design up around their neck and shoulders on the jersey? That pattern around the neck and shoulders is common to that style of Adidas uniform, which a number of schools are wearing this season (ND, Michigan, Nebraska). It’s more visible on a colored uniform. Re: South Carolina hoops player – My wife coaches high school basketball, and her players like to roll the waistband down on their shorts. It looks like total crap. Especially on their royal blue away unis. It creates an ugly white band that totally ruins the look. She has warned them that if she can see it from the sideline, they get pulled from the game in order to fix it. I’ve wondered for a long time why you never see basketball players with shorter shorts. I can’t stand (wearing) long shorts, particularly in an athletic context. The problem has been exacerbated in recent years as the default cut for a basketball uniform moved toward the tightly cut top with long billowy shorts (the fact that the closeness of the top looks odd with the bagginess of the bottoms is a whole different issue). In any case, I’ve wondered what a player would do if he wanted a more “normal” pair of shorts, say an inch or two above the knee. Rolling is kind of a bad solution because it raises the inseam and just generally ruins the way the item fits. It seems to me that if a player (particularly a consequential player on a high profile team) wanted shorter shorts, their sponsor could make it happen, no? Well, a lot of guys–myself included–want kids. Wearing the longer shorts gives us some breathing room. Besides John Stockton, who was notorious for wearing short shorts after most other NBA players started wearing longer shorts, I wonder who the last NBA player was to wear short shorts? That is a really interesting question. Aside from the Lakers throwbacks from a few years ago against the Celtics. As soon as I turned on the ND/Kentucky game I was waiting for this post. I get what they are trying to do (we’re talking about them right now) but it was more annoying that anything trying to read the numbers. Maybe SI can color-correct them. I tend to use FestiX for Festivus. Paul can do what he likes on UW, but I would likely gloss right over any and all tattoo talk. I am more interested in the team-issued uniforms. Tats, on the other hand, don’t go on eBay as game-worn, and follow the player along with his eyes, tongue, and belly button. To me, it just isn’t the same. My mind had a hard time with the black Athletics uniforms as well. My eyes insisted on trying to draw the green out when watching highlights. I don’t understand all the whining and blubbing about ND’s black unis. Sure they are ugly but I have absolutely no problem distinguishing the numbers and such. Y’all need to get your vision checked and get tested for color blindness. Absolutely correct. We spend quite a lot of time researching small details to get the picture looking exactly as it would have at the time. I could if I wish include spurious colours (as opposed to those I can’t find out) – but that would defeat the whole objective. That other guy (not Jeff) is a troll. I deleted his post and Jeff’s response. The fleer sticker project rules! Nice find and look at the Frank Robinson starting lineup figure. The Hornets want to change their colors to red, gold, & blue? WE HAVE ENOUGH RED & BLUE NBA TEAMS! I think them incorporating gold when the team first moved along with the purple and teal (meh, teal is close enough to green) already incorporate traditional Mardi Gras colors of purple, green, and gold. The NBA needs to pass a rule banning teams that don’t already have red and/or blue in their color schemes from adopting them. How about someone outside of Oklahoma City adopt green & gold? Or better yet, move a team to Pittsburgh and adopt black & gold? I agree, it’s getting really unoriginal these days. Apparently, New Orleans feels they have to make up for the Nets getting rid of blue & red – like there’s some league-wide balance of colors they need to maintain. They’re wrong, of course, but I can’t think of any other reason to want to use those colors when they actually have a relatively unique scheme now. I was OK with teams like the Wizards going back to those colors. (It was their traditional colors, and besides, its DC.) But yeah, the NBA otherwise needs to freeze that movement. Wasn’t there a Uni-Watch article a while back about it? That’s 23 out of 30 teams, including the entire Southeast and Northwest Divisions! Could’ve been as high as 25, but the Nets recent color changes and the Cavaliers removing blue post-LeBron helped reduce that number. (Wine is different enough from red to keep them off this list.) Of those 23 teams, five of them (Sixers, Wizards, Pistons, Hawks, and Clippers) use both red and blue. Yes, the Hornets made the list because teal passes for blue, although it could also pass for green. They probably should tilt the teal more towards green and have a unique color scheme by NBA standards. While listening to the Louisville/Rutgers game last night, Paul Rogers (WHAS) kept mentioning how difficult is was to differentiate the numbers on the on the Rutgers uniforms. He said, several times, that the reflective fabric made it nearly impossible to tell which RB carried the ball since one wore 23 and one 28. Looking at the female fan to the upper left of KSU’s #78, her coat also changes color from Black to a greenish hue as do the official’s pants. Seems like an over-correction of the entire photo rather than a deliberate attempt to colorize the Baylor jerseys. The TV camera above #22 changes quite a bit as well. Worth pointing out: When a design fails to achieve its most basic functional purpose – in the case of uniform numbers, that would be permitting a referee or spectator to identify the players on the field – then it is, objectively, bad design. Aesthetics are basically subjective; if you find something ugly and I find it pretty, there’s no arguing the point. We’re both right. But design can be judged by objective standards independent of the subjective question of whether it looks pretty. All too often of late, sports design fails the most basic, objective tests of quality. So many college ball unis may or may not be ugly, and they may or may not be appropriate, but they are bad design. That argument is kinda moot ever since MLB decided to let everyone wear #42 on Jackie Robinson Day. The idea of athletes agetting brand logo tats certainly deems right up paulsalley. Was it Rip Hamilton several years ago or somebody else on the Pistons that patterned his hair like a Bridgestone tire as an ad plug? Marcin Gortat! He has a tattoo of the Jordan logo on his leg, which is as clear as day, under you’re the executives of Reebok, who gave him a deal and then asked if he could cover it up at all times! Thanks for the mention of the Orioles 1971-71 orange monstrosities (I say that with complete affection). As you probably know, Paul, they were worn as throwbacks for an Orioles game vs. Tampa Bay in St. Petersburg in 2010. After the game, the Rays auctioned off both the Orioles and Rays gameworn jerseys as well as jerseys for each of the O’s HOFers (and maybe the Rays, too — I never checked — although the only one would be Wade Boggs). Matte helmets with glossy stripes and logos. Can someone please perfect a damn matte sticker so these annoying matte helmets are less annoying! Just got 6 pop-unders at once when opening this site. Absolutely obnoxious for a site that complains so much about intrusive advertising.